Nikkatsu, the oldest film studio in Japan, inaugurated a star system in the late 1950s, finding talent and contracting to their Diamond Line for a series of wild genre pictures. 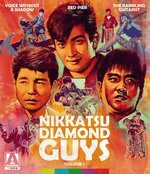 “Nikkatsu Diamond Guys – Vol 1” (1958/59) celebrates these “Diamond Guys” with three classic films from directors Seijun Suzuki (“Branded to Kill”), Toshio Masuda (“Rusty Knife”) and Buichi Saito “(Lone Wolf and Cub: Baby Cart in Peril”). An old hand at tough guy action roles, Hideaki Nitani (“Tokyo Drifter,” “Massacre Gun”) stars in “Suzuki’s Voice Without a Shadow.” Asako, a former telephone operator, once heard the voice of a murder suspect that has continued to haunt her. Years later her husband invites his boss, Hamazaki, over for dinner and she realizes his voice is suspiciously like that of the killer. Before she can investigate further, Hamazaki is found dead and her husband becomes the prime suspect. Next, 50s subculture icon Yujiro Ishihara (“Crazed Fruit”) stars in Masuda’s “Red Pier” as “Jiro the Lefty”, a killer with a natural talent. Shortly after arriving in Kobe, he witnesses a man die in a crane accident, which turns out to be a cover-up for a murder. Jiro soon finds himself on the run, tailed by a determined cop. Finally, in Saito’s” The Rambling Guitarist,” mega star Akira Koabyashi (“Battles Without Honour and Humanity”) stars as wandering street musician Shinji, who falls in with mob boss Akitsu after saving one of his henchmen in a bar fight. Tasked by Akitsu with evicting an offshore fishery, Shinji finds himself in the middle of a very unusual domestic dispute. High Definition digital transfers of all three films from original film elements by Nikkatsu Corporation, with original uncompressed mono audio and newly translated English subtitles. In a Blu-ray/DVD Combo from Arrow Video/MVD Entertainment Group. “Comin’ at Ya!” (1981 – Italy) is a fan-favorite spaghetti western, here in a 35th Anniversary re-release that includes its debut on Blu-ray 3D. Directed by Ferdinando Baldi (“Django”) and written, produced and starring spaghetti western legend Tony Anthony. 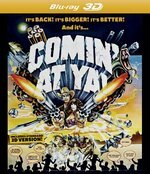 Independently produced, “Comin’ at Ya!” was originally released theatrically in 1981 by Filmways Pictures and went on to gross over $12 million domestically in only 200 theaters in North America (over $30 million in 2016 dollars when adjusted for inflation), long before independent films were a regular staple in multiplexes. “Comin’ at Ya!” happily embraced the 3-D technology of its time, not only taking advantage of the depth that the technology provided, but also taking every opportunity possible to throw, shoot and point things at the viewer at every possible turn and created a cult classic movie as a result. The new home video version was supervised and produced by Tony Anthony himself and Tom Stern (“In God’s Hands”), through his company Sternco 3D. Sourced from a new 4K master, the film boasts a frame by frame digital conversion of the polarized over-and-under format of the original print, sourced from a brand new internegative into the MVC 3D format and new 5.1 surround sound. The story line: Tragedy strikes as two ruthless brothers burst into a chapel and kidnap a bride during her wedding, shooting the groom (Anthony) and leaving him for dead. Hurt and angry, he begins his quest to find his love, and take vengeance upon the wicked. Sound familiar, Mr. Tarantino? On Blu-ray 3D/2D and 2D DVD from MVD Entertainment.